Synopsis : Chair4Life has a seat which goes up and down enabling disabled children to be at the same height as their friends. 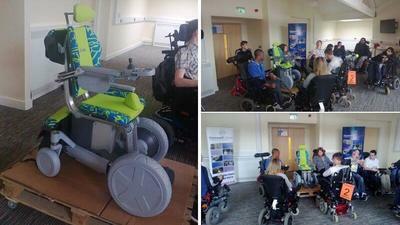 Last week, the Renfrew Group visited Hereward College in order to exhibit their latest product called Chair4Life. Chair4Life is a new wheelchair designed for young people. The chair, has a seat which goes up and down, enabling disabled children to be at the same height as their friends. The Renfrew Group who specialize in motorbikes were asked by the NHS to come up with the design prototype which is hoped to go into full production. The design firm from Leicester, which has worked on Rolls Royce, Aston Martin and Triumph motorbikes has recently unveiled their latest creation at Hereward College where students have advised the designers about the chair design and functionality. "Sometimes I don't get noticed and I have to shout really loud in order to get people's attention. With this chair, because the seat goes up and down, it's an advantage." "You're at the same height with other people so you don't feel intimidated by people standing over you." Hereward College is a general further education college located in Coventry. It offers inclusive provision with specialist facilities and services for students with a wide range of learning difficulties and/or disabilities. Hereward College has been awarded with Investors in People 'Gold', Matrix Standard and is a Mindful Employer. It is the only College in Coventry which was awarded with a 'Good' grade by Ofsted.